Escape the crowds of Milford Sound as you cruise through the popular glacier-carved fjord on a full-day excursion, round-trip from Te Anau. The 1.5-hour Milford Sound morning boat trip glides past stunning sights like Mitre Peak, situated in the UNESCO-listed Fiordland National Park. En route, stop for short walks at scenic spots like Mirror Lakes and the Chasm. Enjoy small-group transport by mini-coach, limited to 33 people, which ensures personalized attention from your guide. Includes lunch plus hotel pickup and drop-off. After a convenient hotel pickup by mini-coach, depart Te Anau in the morning for the 2.5-hour drive to Milford Sound. Stop with your small group at Mirror Lakes for a photo break, and hear interesting narration about the regional flora and fauna from your guide en route to the World Heritage–listed Fiordland National Park. On arrival, join other travelers for a 1.5-hour Milford Sound cruise before the crowds descend upon this Eighth Wonder of the World. Peer through the boat’s large viewing windows inside the cabin, or get fresh air on the spacious outdoor decks. Your skipper provides illuminating commentary while several naturalists on board point out marine life as you search the icy waters for penguins, bottlenose dolphins and New Zealand fur seals. Focus your eye on cascading waterfalls and the 5,550-foot-tall (1,692-meter) Mitre Peak before your return trip to Te Anau. You’ll have lunch and stop to explore several scenic spots on foot, such as the Chasm nature trail, Lake Gunn and the stunning Eglinton Valley, before drop-off at your hotel. This was a fun trip, with a fun and interesting driver. We left the rental car at the hotel and appreciated being able to look out the window. We took the earlier morning trip and almost had the ship to ourselves, and thus had spots at just about any railing we wanted. The mid-day departure looked like it would be crowded. The included lunch was just right. Great day-tour from Te Anau with a good driver. The weather could better on the Milford Sound cruise. Beautiful scenery, comfortable boat. The rain was heavy and made the views slightly less stunning. The drive to the Sound was ok but not as beautiful as we had expected. Overall, the mountains and fresh water lakes were the highlight of the day. My lunch order got mixed up and this led to very little to eat on a very long day. Fabulous trip would highly recommend. Unfortunately our tour time for Milford Sound with the operator was continually altered. 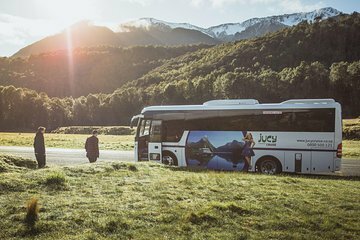 We were advised the day before that the bus had mechanically problems that would be collecting us and we were moved onto another bus coming from Queenstown. Not exactly a small group! Whilst the tour of the sound was excellent the constant changing by the operator was unprofessional. this tour was fabulous, nice and small and personable. 'Peter' our driver for the day was superb, adding extra photo stops in when he had time. The lunch on the boat was pretty poor, but we already expected that and brought a wee bit extra of our own. Overall it was brilliant. Wonderful tour! On our tour, we stopped approximately five times each way at beautiful lakes, waterfalls, and sights. Great guide and commentary. Boat tour was not overcrowded and offered an included lunch (our's was not a boxed sandwich!). I would highly recommend. The tour guide, Simon, was outstanding. His knowledge and passion matched the unforgettable scenery on the bus journey to Milford. The cruise on the sound was amazing with seal spotting a real bonus. Our driver, Simon, was witty, fun and a wealth of information about the area, the environment, and the geologic development of the sounds. He was great. The bus we rode on from Te Anau to Milford was a little less than ideal. For a road like that, the suspension needed some work. It would sway enough to induce mild nausea and the rear tires would regularly rub in the wheel wells around tight turns or deep dips. I don't think it was unsafe, but a little unsettling. The boat was large enough to accommodate several hundred people, and did. Not at all unsafe, but a little crowded for my liking.